New market research study “Commercial Payment Cards: The U.S. and Global Markets and Trends, 7th Edition” elaborated by Packaged Facts has been recently published by Market Publishers Ltd. According to the study, even with assumptions that international economies may witness lower growth or even mild recession, now it is high time card issuers and marketers doubled-down on the USD 730 billion U.S. commercial and small business card market. As new job formation bears signs of accelerating at the start of this year, business expansion seems to breathe life into the U.S. economy. And, even with assumptions that international economies may witness lower growth or even mild recession, now it is high time card issuers and marketers doubled-down on the USD 730 billion U.S. commercial and small business card market. Over the next few years, several trends will be at the forefront as commercial card issuers and marketers pull out of the stops to take a position in a highly competitive and dynamic business environment. Analytical tools for the card issuers and the card program managers will become more robust and flexible as risk management and fraud detection start playing an increasingly important role. 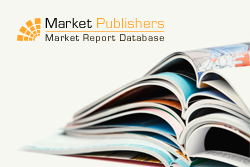 New market research study “Commercial Payment Cards: The U.S. and Global Markets and Trends, 7th Edition” elaborated by Packaged Facts has been recently published by Market Publishers Ltd. The report provides key data and in-depth analysis on the global and U.S. market for commercial payment cards as well as the commercial electronic payments market in the U.S. It features the size and growth of the market and related key metrics within the broader payment card arena; includes discussions of the various card associations or networks, commercial payment card types, trends and factors affecting their growth, and a focused analysis of commercial card consumer demographics and preferences; profiles major card brands and issuers. Furthermore, the study presents an up-close look at the U.S. commercial automated clearing house (ACH) market, besides offering card volume data by product category and by region and commercial card volume product segmentation for the U.S.
More new market research studies by the publisher can be found at Packaged Facts page.